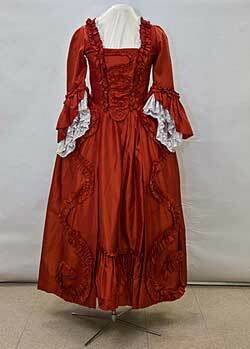 Colonial Williamsburg’s Costume Design Center opens its door for behind-the-scenes tours. Guests can meet staff members and explore the building where most of Colonial Williamsburg’s Historic Area costumes are designed and maintained. Williamsburg is located in Virginia’s Tidewater region, 20 minutes from Newport News, within an hour’s drive of Richmond and Norfolk, and 150 miles south of Washington, D.C., off Interstate 64. The first six costumes for the Raleigh Tavern hostesses were constructed by Mrs. H.G. Cooley, who produced the dresses from her Williamsburg home — Colonial Williamsburg’s first costume shop. 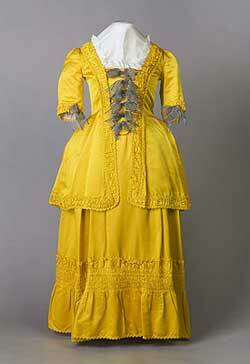 Following the success of her Raleigh Tavern gowns, Mrs. Cooley was contracted on Nov. 5, 1934, to construct costumes for staff in all Restoration buildings at $30 a gown. From the six initial costumes and one seamstress in 1934, the staff today is headed by Rosseau and includes tailors, cutter-fitters, craftspeople, costume maintenance technicians, inventory control clerks and a designer. 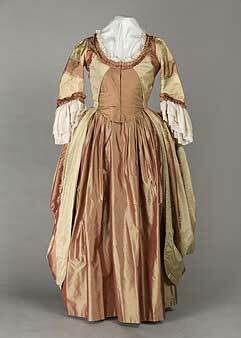 In 2008, the center designed and produced 2,454 items of clothing and accessories for Colonial Williamsburg interpreters. The 18th-century clothing pieces the Costume Design Center creates for Colonial Williamsburg’s staff are used as interpretive tools themselves. Costumes add to the colonial ambiance and help delineate class and occupation. They also help hook guests to the greater story of Colonial Williamsburg. There are about 144 types of garments from underwear to outerwear issued dressing both genders and all strata of colonial society. For women, the design center produces gowns, petticoats, stays, shifts, women jackets and bed gowns, caps, hats, kerchiefs, aprons, pockets, hoops, jewelry, mitts, gloves, cloaks and riding habits. For men, the design center makes shirts, stocks, cravats, breeches, trousers, waistcoat, sleeved and sleeveless jackets, coats, great coats, cloaks, kerchiefs, caps, spats and hats. The design and construction process for a Colonial Williamsburg costume in the 18th-century tradition is intensive. 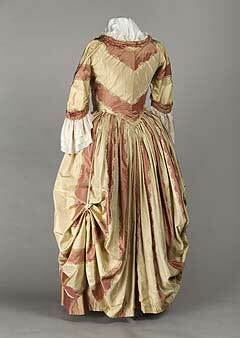 Most garments for Historic Area use are adapted from patterns taken from the original garments or 18th-century depictions. Patterns from the originals are digitized with a computer-aided design system and then manipulated in computer-aided design software by the cutter-fitters to fit the employee, producing a custom pattern. All of the major women’s wardrobe pieces, such as stays, gowns and jackets, and most of the men’s pieces are produced in-house. The Costume Design Center makes clothing for the Historic Area, including orientation interpreters, group services, site interpreters, both public and domestic, military programs, Fifes and Drums, coach and livestock, Historic Trades (with the exception of the milliners and tailors who make their own), Revolutionary City and theatrical interpretation. For evening programs, the design center makes all of the Historic Area costumes, including “Cry Witch” and the African- American interpretive group, the 18th-century play series and “Grand Medley of Entertainments” at the Kimball Theatre. Costumes also are need for all Electronic Field Trips, all photo shoots requiring 18th-century dress for Colonial Williamsburg Journal, Historic Area stores and products staff, all taverns character interpreters, entertainers and managers, and employees at the Raleigh Tavern Bakery. The largest project for the design center in 2008 was the redesign of the Fifes and Drums coats as part of their 50th anniversary celebrations. The regimental coat was adapted from a surviving British example and debuted last July 4. The Costume Design Center is finishing new regimental coats and small clothes (breeches and waistcoats) for military programs that were previewed this year on Independence Day. 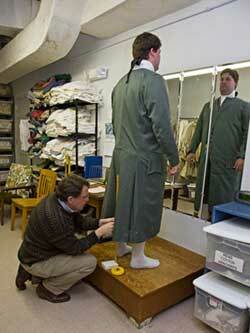 Colonial Williamsburg’s Costume Design Center opens its door for behind-the-scenes tours on Thursdays through June 10. Guests can meet staff members and explore the building where most of Colonial Williamsburg’s Historic Area costumes are designed and maintained. Williamsburg is located in Virginia’s Tidewater region, 20 minutes from Newport News, within an hour’s drive of Richmond and Norfolk, and 150 miles south of Washington, D.C., off Interstate 64. For more information about Colonial Williamsburg, call 1-800-HISTORY or visit Colonial Williamsburg’s Web site at http://www.history.org.